Our local library has a colorful history of being haunted. Two librarians died in the library under unusual circumstances. One hung herself from the attic rafters and another was battered to death by a book cart. Spend a little time there and you’ll hear footsteps, feel as though you’re being watched, see ghostly apparitions browsing the stacks or sitting and reading, see runaway book carts and ghostly children sitting with young children during story time. It’s a lively place with a history that very few people discuss. On overcast rainy days it’s not a place where you want to be — yet it is ideal for relaxing with a good gothic tale — especially with what is going on in the library. Seriously, I prefer being home on such days in my comfortable chair with a lap robe and my Kindle, but I digress. I was at my local coffee shop on such an overcast rainy day and I met Graham who had a story to tell about his college library. He and four of his friends worked at the library. They were given the task one evening after closing to clean the third floor, which was believed to be the most haunted area of the library. They did split up to cover the area. Immediately Graham felt a kind of static electricity surrounding him. He was uncomfortable, but he didn’t want to alert his friends. When the lights started blinking, Graham and his friends became concerned. He was teased a bit about being afraid of the dark, but they all felt the cold air that blew throughout the area. Graham looked around and saw a middle aged man dressed in a dark suit carrying a couple of books and looking in the stacks. When he first started working in the library, the librarian told him about an English professor who haunted the library. At the time Graham accepted it, but didn’t think much of it. He believed in the paranormal, but he didn’t think it odd that college professors wouldn’t be haunting the library from time to time or the lecture halls or classrooms. So when he saw the gentleman ghost, he assumed it was the English prof.
As the spirit moved around, the lights blinked. The elevator chimed and the doors opened. Graham and his friends stood still watching and listening. No one came out of the elevator and no one went in, but the doors closed and the elevator moved down. Books were falling from the shelves from various areas. Graham wondered if a group of spirits got off the elevator to mess with them. A book cart slowly rolled towards them. When Graham reached out to stop it, it picked up speed with Graham taking a ride on this runaway cart. It headed for the elevator. When Graham thought he would crash into it, the door opened. On the ride up and then down he could hear soft laughter. He wondered if this was an reenactment of a fraternity hazing that happened a number of decades previous. He tried to remember this particular incident. Did it happen in the library? He remembered that it did involve books, but a book cart . . . Graham closed his eyes to think. He took a few deep breaths. When he opened his eyes he had a vision of a young man blindfolded with hands and feet bound with a rope. He was on a book cart, bumping along a path pushed by young men in long coats. Each one yelling insults at the one on the cart. Up ahead near a tall tree was another man making a noose from a coil of rope. “What do we have here, boys?” he said. “A horse thief,” was the reply. The noose was put over the young blindfolded man’s head. He was removed from the book cart and raised just a few inches in the air. If he stretched out, his feet would have touched the ground, but he was so scared . . . The cause of death was not hanging, but . . . could one die from being scared to death? That seemed to be what happened. From the research Graham did, he found that each of the young men involved in this hazing incident all died within a year. Was this revenge . . . or guilt? Of the six fraternity brothers involved, two fell down the elevator shaft, three hung themselves on the third floor, and one was crushed to death under the weight of fallen bookshelves. They were destined, so it seemed, to play out their deed for eternity. Residual hauntings can’t harm the living, but they can be frightening. I’d rather see the old English Professor than these frat boys any day. There are plenty of old houses where I live. I sometimes get a weird feeling from houses, just passing by them. Some are inviting and others feel creepy and I don’t even want to look at them. Has this happened to you? I believe every house has the potential of being haunted. Not scary haunted, just having a previous owner who has passed still living there. It starts out with a feeling of being watched. Then you may feel cold or increasingly uncomfortable. Depending upon the spirit, you can either feel welcome or unwelcome. I have walked into houses and immediately wanted to leave. It’s awkward when you’re invited to dinner and just don’t want to stay another second. You truly believe something horrible will happen to you if you do stay. Sometimes you see something out of the corner of your eye. You know you’re not imagining it, but you do shrug it off. You don’t want to say anything, not everyone shares your belief in the paranormal. And, honestly, how do you tell a friend that their house is creepy? The interesting thing is when you do make contact with a ghost, who doesn’t know he or she is dead. There have been times when I’ve talked with a ghost and didn’t know it was a ghost. It thought I was a ghost. I was looking to buy a house a number of years ago. There was a great open house that served food and allowed potential buyers to look around and get a “feel” of the house. I suppose it was a way of imagining how it would feel to live there as opposed to most open houses where they invite you in, quickly show you around and out the door you entered. It was a friendly crowd who were sitting around enjoying the buffet. I wasn’t sure how many realtors were there and how many were potential buyers. It didn’t matter to me. I was enjoying the setting and was curious about other homes in the area they may have seen. For me, it seemed to be a way of comparing notes of different houses in different price ranges. I noticed an elderly woman standing off to the side with an unpleasant expression on her face. She seemed to be upset about something. Being a curious person, I walked by her and stood close by, but not too close. I told her it was an open house. Well, I’m not one to tell her they were real. At the moment I didn’t know I was talking to a ghost. Later, my realtor was asking me why I was standing there talking to myself. Fortunately, she shared my belief in ghost so I told her I was talking to the previous owner who didn’t know she was dead and didn’t want to sell her house. She left to talk with the realtor who was hosting this open house. We did make a hasty retreat. He was probably afraid I would tell his potential buyers the place was haunted. I can only imagine how the family that moves into that house are going to feel to have a resident ghost who doesn’t want them there. Well, I’m usually at my local coffee shop, if they wish to talk . . . I wonder how the dear old woman is coping . . . I hope you liked this real ghost story and it got you thinking about the paranormal. There’s an old park in town with a sinister history. I avoid it as much as possible. There is an open theatre there and during the summer they put on family plays. They are held in the afternoon so the park is empty well before dark. This is also a popular place for Easter Egg Hunts and activities for children on Easter Sunday. Many have seen apparitions on stage and there have been reports of seeing robed men carrying lanterns and chanting while they walked throughout the park. It is believed to be a satanic group that has taken over the park and also responsible for the attacks that many claim to have occurred over the years. Some believe their are demons hiding in the bushes keeping an eye on the park. Actually, there are conflicting stories. There are those who want people to stay away from the park and there are those who say the park is safe and nothing has happened there. I believe what I have personally experienced and what I’ve heard from reliable sources. And, as I said earlier, I avoid the place. Early one Saturday morning I heard the insistent ringing of my doorbell. I couldn’t imagine who it could be and I was going to ignore it when I heard my name being called. I knew it was my friend Barbara. Her husband, Harry was in the car with their nephew, Joel and his girlfriend. “Grab your coat and come with us.” Barbara ordered. She must have sensed my hesitation. She grabbed my arm and led me to their car. 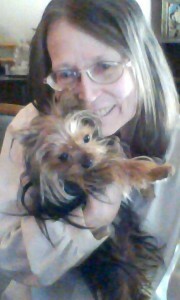 Evidently, Julie and her sister ran home, called Joel, who called his Aunt Barbara, who came to get me . . .
“Now, we’ll have proof of satanic activities going on at the park,” said Barbara. Quite frankly, I didn’t care. I’m content to allow people to do as they please as long as they don’t involve me in their activities. I didn’t really want to see the pentagram or be anywhere near that park, but I held my tongue. Harry parked the car and we got out with Julie leading the way. Yes, there was evidence of a pentagram with candle wax melted on it. It gave me a chill. The wind picked up and before we got back to the car, it started to hail. Something strange was definitely going on and we didn’t need to be out there. Harry couldn’t get the car started. There was panic in the car. The windows were all steamed up and at various places the message “Get Out” was scrawled on the windows. Harry got the car started and we darted down the street away from the park and the pentagram. We went to Barbara and Harry’s house. That was all right with me, I wasn’t ready to go home just yet. We sat at the kitchen table while Harry made a fresh pot of coffee. Barbara started cooking pancakes, she cooked when she was upset. It was fine with me, not that I wanted breakfast, but it was comforting to watch “normal” morning behavior. We knew what we saw and what we experienced. We didn’t need a picture, the memory was freshly imprinted on our minds. It wasn’t an experience we would soon forget. We settled down to eating our pancakes and discussed everything except the incident we just experienced. We didn’t want to open the door to going back to take a picture or do a video. Are You Familiar With Ravensblight? Ray O’Bannon is a talented artist who created Ravenscraft. Since it is finally fall/autumn, I thought I’d share some of my favorite Ray O’Bannon Haunted Toys. Of course, it’s The Ghost House! It also has a Secret Chamber . . .
Well, as I remember the story . . . The house was built in 1820 by Captain Joshua Harsh. Yes, his temperment seemed to match his name. He was a seaman — a Ship Captain as I recall . . . but he was rumored to be a pirate . . . and into the dark arts. He built this house, but the building only occurred at night . . . not a strange occurance in Ravensblight . . . but all the same, it seemed quite odd. He did bring home a bride to his new home . . . who was heavily veiled . . .
And she died mysteriously after lighting the lamp post in the yard . . . do you see it? That lamp post still burns brightly . . . even to this day . . . inspite of other residents who purchased this property . . . and is still burning as it is awaiting a new owner . . . This papercraft has a Secret Chamber which I mentioned earlier . 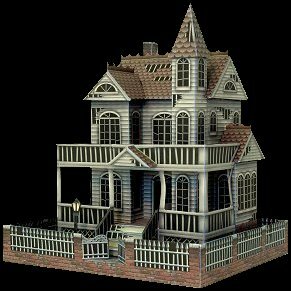 . .
That’s what makes this paper craft Ghost House so special to me! I can put some of my own “treasures” inside. I’ve made several of these in the past and given them as gifts . . . I wonder if they found the treasures I selected for them . . . It really doesn’t matter — about the “treasures” . 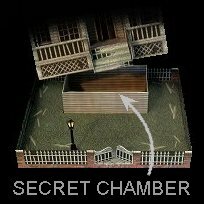 . . just that there is a secret chamber waiting to be discovered. I also added some spooky characters to dress us the place a bit . . . There are two sets . . . It is difficult to decide which are my favorites so I have a selection from both sets decorating my Ghost House . . . and, of course, you can do the same . . .
And, my Ghost House has a story all of its own . . . I just did that for my own amusement, but you can be true to Ray O’Bannon and stay with his story . . . I kind of like having a mad scientists . . . or maybe a coven of witches building this Ghost House . . . and, of course, mine isn’t from Ravensblight, but built in my own hometown . . . which has a colorful haunted history all of its own . . . for those who are interested . . . but not everyone is into ghosts and real ghost stories . . . Seriously, who wants to know that such “interesting” monsters are haunting their hometown . . . ??? All of these Free Printables are compliments of Ray O’Bannon over at Ravensblight. Just click any of the images above to print out your Ghost House and Micro Monsters. Thanks for stopping by! And Happy Fall to you!! I ain’t afraid of no ghosts seems to be the running joke with “ghost hunters”. But in reality, I’m not too sure. We may not be afraid afraid of them, but we can still be startled by them or feel uncomfortable around them. This is a real ghost story told to me by Kevin. One weekend he agreed to house sit for a friend. Basically he was feeding his friend’s dog and cat and hanging out with them for awhile before returning home. His friend told him the house was haunted, but not to worry about it, no harm has come to his family or pets. Kevin wasn’t a believer in ghosts and just took it as his friend messing with him. When he arrived to feed his friend’s pets, he saw something watching him from an upstairs window. He immediately texted his wife to join him at the house. Kevin wasn’t comfortable going into the house alone. When his wife arrived, he told her to stay outside and he went in alone to check out the bedroom window where he was sure someone was watching him. He went through the whole house feeling a bit foolish. Nothing was there. He and his wife fed the dog and cat and settled into the living room to watch a DVD that Kevin’s friend set out for him to watch. The dog was barking at something on the staircase. The cat settled on the sofa next to Kevin’s wife, Maureen. Kevin went upstairs to investigate what had the dog so upset. When he returned he was white as a ghost, shaking and having trouble breathing. Maureen went to him. She was going to go upstairs, but Kevin blocked her from going up. Once he settled down, he took Maureen by the hand and showed her what scared him. He explained that he saw someone in that front bedroom window looking at him when he arrived. When he went upstairs the first time, the door was open. When he went up the second time the door was closed. When he opened it, there were three coats hanging on the bed post — one inside the other. Downstairs, they heard noises in the kitchen and found all the pots and pans stacked one on top of the other on top of the stove. They knew the stove was clear of any pots and pans when they fed the dog and cat. They turned off the television and DVD player, ejected the DVD and put it back in its case and left the house. Before this incident, Kevin and Maureen didn’t believe in ghosts. They did return later that day to take the dog and cat along with their food, bowls, litter box, beds, toys, etc. with them. Neither of them had any desire to return to the house. When Kevin’s friend returned, he explained to him what happened. His friend wasn’t surprised. He said things like that happened all the time. It seemed to be poltergeist activity that was occurring in the house. If Kevin’s friend was comfortable with it, then it was his business. I wouldn’t want to be in a house with poltergeist activity. I would prefer ghosts.